New reengineered bins became lighter, much stronger and can be nested when shipped to reduce delivery cost. Hugo Ramos, Business development manager from Macro Plastics, shares with us advantages of the New hybrid 1012 and 1212 bins. The Hybrid 1012 is incredibly versatile making it perfect for the toughest harvest, storage and shipping conditions. The footprint is ideal for returnable export and shipping applications with the best return ratio of any rigid agricultural bin used for shipping. The exceptionally strong Hybrid 1212 has been designed as the ultimate harvest bin and most cost efficient, as the column and feet inserts can be removed, so the bins can nest, to fit a greater quantity during transport, then they are locked into place at destination. Once filled, the bins interlock for safer stacking during storage. 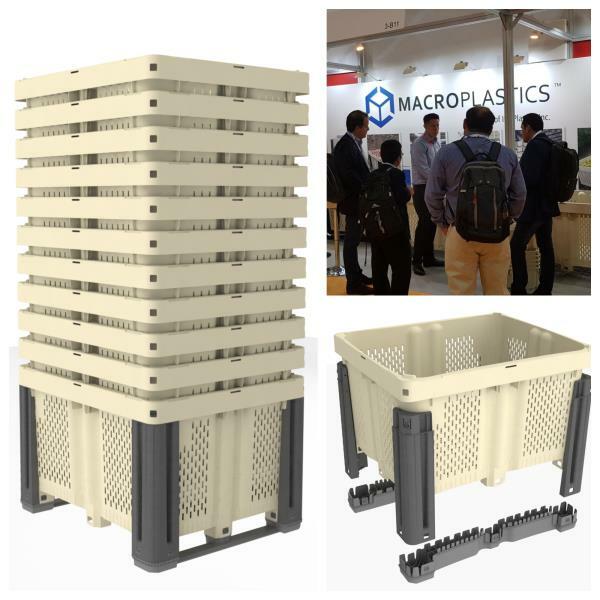 Macro Plastics began production of Hybrid bins in September 2018! "This is only the second time I’ve seen these bins myself as they are brand new and we have just started manufacturing", - confesses Mr. Ramos pointing on Hybrid 1012 and 1212. "All other plastic bins on the market have a 15-year-old design. Each company only makes them lighter or uses different colors etc. We have completely reengineered our plastic Hybrid bins. No one has similar products on the market and no one has done this before." Macro Plastics has nearly 30 years of experience in manufacturing plastic bins for the agriculture industry and is among the world’s largest manufacturer of bulk plastic containers. New injection-molded plastic bins feature an innovative perimeter geometry that is designed to keep the walls from bowing out. Tapered walls prevent adjacent bins from crashing against each other, creating a “bruise buffer” zone to protect delicate produce from damage during transport, storage, and in the field. Newly engineered columns improve impact resistance while the bins feature smoother, rounder edges with 10% more ventilation for faster cooling and better air flow throughout the bin. "These bins are the most efficient to ship worldwide and they are the most efficient rigid agricultural bins. Other collapsible bins are also quite efficient in shipping, but they aren’t as strong and durable out in the field. People prefer rigid harvest bins. Because of the efficiency in shipping we can be price competitive just about anywhere in the world"– ends Hugo Ramos. The Hybrid 1012 and 1212 can be stacked high, achieving greater storage efficiencies for growers. In a stack, the top bin doesn’t nest into the bottom bin, instead it is secured by lugs, which allows full use of the internal volume, and keeps the feet and strap of the top bin away from the valuable contents below. More company information: Macro Plastics Inc.